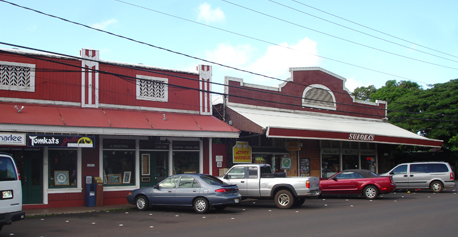 Koloa, just north of Poipu, is pretty much just a couple of blocks of shops. There’s a grocery store, a bank, a post office, and a good pharmacy (not drug store) in addition to more boutique-y/tourist places. Wheelchair access is very iffy. Ramps lead up and around buildings to stairs. Short stretches of sidewalk lead to more stairs. Even ground level stores have one-step verandas. From one store to the next, you have to go out the front, around the entire building to the back (you could go out the back, there’s a ramp there, but it ends in a step between it and the ramp from the front! ), then around the entire building again at street level (no sidewalks), up another ramp, and now you can get into the store next door.